As news headlines scream fresh concerns about global food security – and as many African countries continue to struggle with poverty and hunger – too little attention is being directed at what could be a major part of the solution to all this: smallholder farming. Africa’s smallholder farmers not only have the potential to produce enough food for export – and thereby contribute to food security worldwide – but also to lead the way to robust growth and development across the continent. It is an accepted fact that price volatility for agricultural commodities is no longer the exception, but the norm. And we believe that, with the right kind of investment, access to information services and markets, African farmers can lead an economic renaissance on the continent. But to get there we have to accelerate the investments and policy prescriptions that will invigorate African agriculture and empower smallholder farmers to increase their productivity and their success. The first steps in this direction are already showing great promise. Thanks to new policies and innovative investments by national governments, donor countries and multilateral organizations – as well as many civil society organizations and private sector enterprises – rural women and men in a number of African countries are reaping the benefits of access to markets where they can purchase seeds and fertilizers, and where they can sell the crops they grow. They are responding by increasing their yields, increasing their production and increasing their marketed surplus. And their surrounding communities are benefiting from this. But much more needs to be done for people living and working in sub-Saharan Africa’s rural areas to enable them to raise their productivity and increase their incomes. 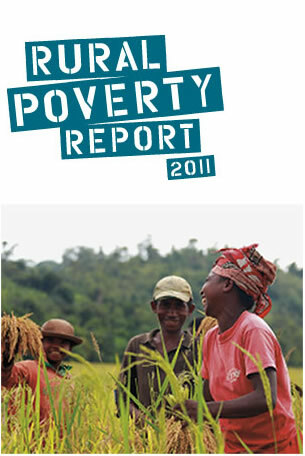 According to the recently released Rural Poverty Report 2011 by the International Fund for Agricultural Development (IFAD), sub-Saharan Africa has the highest incidence of rural poverty anywhere in the world, and is the only region in the world where the numbers of rural people living in extreme poverty is still on the rise. More than 300 million rural people on the continent – some 60 per cent of the rural population – live in extreme poverty. The importance of farming as an income source on the continent cannot be underestimated. Agricultural markets are changing. No longer do we need to think exclusively in terms of export crops; new market opportunities are emerging on Africa’s own doorstep. As cities expand and incomes increase, people in the urban areas are changing their eating habits and are becoming consumers who want more meat, dairy products and vegetables, and they expect higher quality standards – we are seeing this across the continent. And agricultural value chains are expanding and becoming better organized to respond to this new demand. These modern markets bring with them their own challenges for some smallholder farmers in terms of higher entry costs, but the potential opportunities they bring cannot be overlooked. So what needs to happen to make the most of these opportunities, and for smallholder agriculture in Africa to lead the way to economic growth and food security? For starters, national governments and the international community need to reverse the longstanding neglect of rural development. We need to improve governance in rural areas and create a better economic environment for smallholder farmers to succeed and grow not only food but their businesses as well. We need to invest in rural infrastructure. Nearly a third of the rural population in Africa lives more than five hours away from a market town, and fewer than 20 per cent live within an hour of a market town. Only one in five Africans has access to a national electricity grid. Targeted investments in road-building and utility construction can go a long way toward improving farmers’ capabilities and access to markets. Similarly, we need to make investments in the education and skills of rural people so that they themselves can make the most of new opportunities to engage in agricultural markets or work in non-farm industries. This should include strengthening their collective capabilities – and particularly farmers’ organizations – so that they can support each other in managing the risks they face, learn new techniques for improving their productivity, and market their products. Importantly, our investments need to recognize and address the major challenges and risks that rural people in Africa face – such as the deterioration of the natural resource base, growing competition for land and water, and the effects of climate change on the rural landscape. We need to help small farmers not only to become more productive, but to farm in a way that is more sustainable in their use of natural resources, and more resilient to the shocks of climate change. The rural poor are not charity cases. They are people whose innovation, dynamism and hard work will ultimately lead the way into a new era of growth, development and prosperity across Africa. If we can succeed in creating the conditions for poor rural people in Africa to move permanently out of subsistence and into the marketplace – in country after country – then we will have our best chance to transform Africa into a continent that not only feeds itself, but also exports surpluses to increase global availability of food. What a momentous and welcome accomplishment that would be. Tina Joemat-Pettersson is South Africa’s Minister of Agriculture, Forestry and Fisheries. Kanayo F. Nwanze is President of the International Fund for Agricultural Development (IFAD), an international financial institution and a specialized UN agency. They will be participating in a 3 May event in Cape Town, New challenges, new opportunities: African agriculture in the 21st Century convened to discuss IFAD’s Rural Poverty Report 2011.